Just a couple of weeks ago, I posted about the apparent closing of Mimmo's in the Elmhurst City Centre here on the blog. Mimmo's was in the spot just south of Starbucks on the same side of York as the York Theatre. At the time, it looked like Mimmo's was closing, but it was rumored to be slated to be replaced by another Italian eatery. Turns out...that rumor was pretty close to being right. 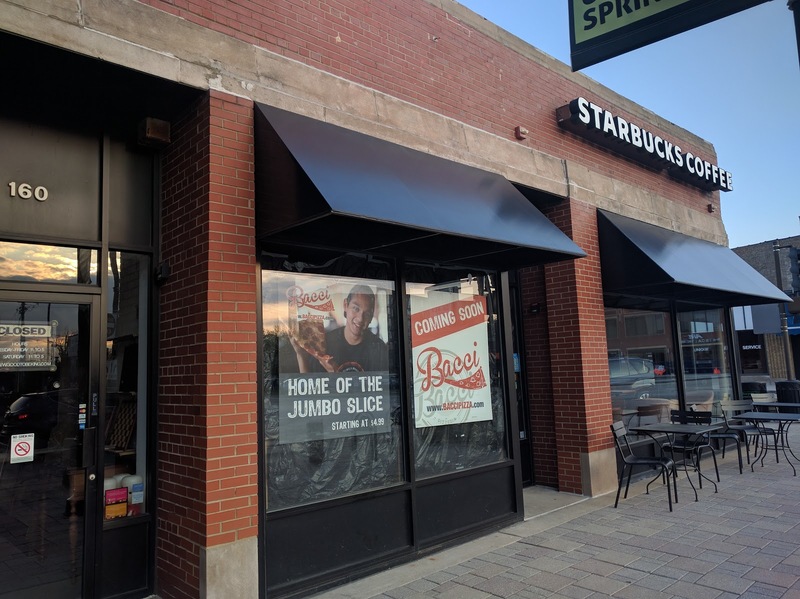 If you walk by the location today, you'll see these new signs in the windows announcing: Coming Soon: Bacci - Home of the Jumbo Slice. If you go to the Bacci site, you'll see that they really play up the Jumbo slice angle. Over there on the site, you'll also see a listing of 11 locations at the bottom. One of them already is Elmhurst! I've been to Bacci before and I don't have a strong memory of the place other than it was a slice shop. I was working on a campaign out in Aurora for Bob O'Connor for Illinois State Representative. And right near the casino in Downtown Aurora was a Bacci Pizza slice shop. We'd go in there every once in a while. Is Elmhurst a 'slice' town? I have to think that they typically do a big lunch business but, can we support it? If so, why hasn't someone else rolled out the slice offer? Like...Armand's or Pizza Palace *could* be in this business, but they're not? Maybe, there's an opportunity? I hate to see businesses fail and especially ones in the Elmhurst City Centre. So...here's hoping that Bacci has much success! And...I'm sure I'll get in there for a proper review shortly after the place opens!